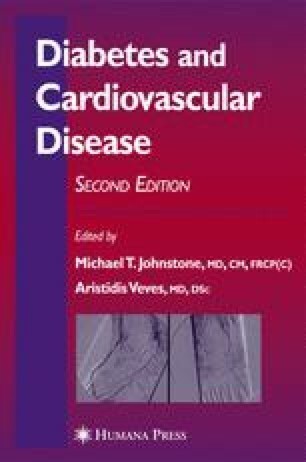 Macro- and microvascular disease are the most common causes of morbidity and mortality in patients with diabetes mellitus (DM). Diabetic vascular dysfunction is a major clinical problem, which underlies the development of various severe complications including retinopathy, nephropathy, neuropathy, and increase the risk of stroke, hypertension, and myocardial infarction (MI). Hyperglycemic episodes, which complicate even well-controlled cases of diabetes, are closely associated with oxidative and nitrosative stress, which can trigger the development of cardiovascular disease. Recently, emerging experimental and clinical evidence indicates that high-circulating glucose in DM is able to induce oxidative and nitrosative stress in the cardiovascular system, with the concomitant activation of an abundant nuclear enzyme, poly(ADP-ribose) polymerase-1 (PARP). This process results in acute loss of the ability of the endothelium to generate nitric oxide (NO; endothelial dysfunction) and also leads to a severe functional impairment of the diabetic heart (diabetic cardiomyopathy). Accordingly, neutralization of peroxynitrite or pharmacological inhibition of PARP protect against diabetic cardiovascular dysfunction. The goal of this chapter is to summarize the recently emerging evidence supporting the concept that nitrosative stress and PARP activation play a role in the pathogenesis of diabetic endothelial dysfunction and cardiovascular complications.